click "what's new" links to see latest Trendlines FreeVenue postings. The items on this page are not chronological. Marsh Lake, Yukon Canada ~ Most of the cumulative co2 in the atmosphere today was contributed by the developed nations. From this point on, the greater of emissions will come from China & India. Their is a shared responsibility to address this unique problem to avert a deterioration in global climate. It is apparent from this chart (by Carmen Difiglio) that the USA, EU, Japan, China & India had together contributed 700 million tonnes of energy related co2 emissions from 1900 to 2005. It seems ethically unreasonable to prevent developing nations (DNs) from the same deforestation and primary industries that aided modern societies to get where they are, The actions within DNs that are needed to prevent erosion of global climate as we know it come with an economic price. Since it takes more than moral suasion, DNs could be moved to better practices by financial subsidy. In that regard, Freddy Hutter of TrendLines Research is proposing the Yukon Protocol. It incorporates the creation of a Climate Change Mitigation Fund that would be available for DNs to draw upon to "green up" their infrastructure. An IPCC panel would arbitrate disbursements from the CCM Fund at their discretion and meeting its priorities. Qualifying projects could include preservation of rainforests and partial subsidization of non-fossil power generation (say $1 Billion/GW of installed nuclear, solar, wind & hydro). The annual sourcing of the Fund would be a levy on all UN countries that is equal to their pro rata share of the cumulative energy related co2 emissions to 2005. Taking the charted nations as example, based on the USA's 310-mt emissions, America would pay 44% of the global allotment to the fund ... say $31 Billion for its initial levy. The EU would contribute 33% of the global allotment based on its 230-mt of emissions ... $23 Billion in this example. Japan's 50-mt 7% emissions would generate a $5 Billion levy. China's 90-mt 13% of emissions generates a $9 Billion levy. India's 20-mt 3% emissions generates a $2 Billion levy. As other nations agree to the Protocol and are added to the chart, the preliminary ratios and respective levies would be similarly reduced. Update 2009/9/23: UK Prime Minister Gordon Brown came on board today with his commitment to the Yukon Protocol principle. In today's NY Times, he will advocate for a $100 Billion fund to be sourced by 2020. Brown is in NY for the annual UN Head of State addresses. It appears to TrendLines Research that the main factor behind this enhanced solar activity was the harmonic of three major solar cycles having a joint maximums in the 1980 vicinity. There was a culmination of the 98 yr period Gleissberg Cycle (as shown in the graph below illustrating sunspot activity ... a proxy for solar ray flux) just as an apparent 220 yr cycle and the common 11 yr cycle were in the finishing stages. Another intriguing component of solar activity is the effects of time between cycles. Altho solar maximums are known to occur every 11 years, in actuality the span has varied from 7 and 17 years betw cycles. There exists a correlation betw the groupings of the short cycles and higher avg temp's on Earth and lower temp's when there are groupings of the longer cycles. These Armagh Cycles seem to have a 200-yr cycle similar to the that shown above. The question arises whether the global heating is associated with the increased total activity, as above, or the increased frequency of activity as below. Or, is it a combination ... where a series of heavy duty maximums often happens in short groupings? This view of the cumulative effect of solar ray flux by looking at its moving average can be compared to the working of your furnace: short cycles are like the furnace coming on often and for short periods as opposed to long sessions which are needed after the house has been allowed to cool down each time. Technicians will tell you that it takes much less energy to keep the house warm with short cycling. Put this all together in a global perspective and temp's are up 0.6C in the last 100yrs. That's what all the fuss is about. Just over half a degree. And everything from forest fires to heat waves to tornadoes to janet jackson's lifestyle are being blamed on this minute global warming. No scientist worth their salt believes that. The media and alarmists often take interannual weather anomalies out of context when discussing natural disasters revealing their inability to differentiate weather from climate. At left, it is seen that since 1981 there has been virtually no temp change at the South Pole; just under half a degree at the Equator; and almost a 2C rise at the North Pole. Both these graphics illustrate the deviation from the 1951-80 era AVG TEMP. But in 1977, normality of nature was altered by Human activity. Scientists found evidence of ozone depletion over the South Pole and their alerts to the global community resulted in the Montreal Protocol and a worldwide effort to reduce CFC emissions into the atmosphere. Today the ozone hole is manageable and emissions are reduced to less than 1950 levels. Research by Jim Hansen of NASA indicates that the chances of holding Earth to a 1C temp rise with a 450-ppm limit on co2 is quite slim. Holding temp's under 3C by 2100 with a 585-ppm co2 limit depends on oil & gas production attaining a plateau mode and "stretching reserves" rather than evolution of the conventional peak and decline model. Fortunately, this scenario is based on the liberal reserve base and reserve growth of oil and gas within the USGS World Petroleum Assessment 2000. That was 1676-gb Oil Reserves and about 669-Gb of Reserve Growth. Natural Gas is similarly USGS defined. For coal, Hansen uses the even more liberal IPCC estimation of proven reserves rather than that of EIA. March 28th delayed FreeVenue public release of Dec 28th MemberVenue guidance ~ The 2011 annual analysis by Trendlines Research of fossil fuels emissions indicates their contribution should result in a peak of atmospheric co2 concentration of 423-ppm in 2029. It should be noted that while rising co2 concentration levels exhibit a correlated upwards tracking with total emissions, the decay pulse would indicate residual co2 will not follow the post peak downward path of emissions as quickly. Most co2 remains for a hundred years and traces linger for almost a millennium. By Year 2100, co2 will have declined to only 348-ppm ... taking us back to 1980 concentrations. The long-term effect of this anthropogenic influence appears to be a delaying of the next glacial event from 7000 AD to the next harmonic in 40000 AD. Underlying the simultaneous total emissions & co2 concentration peak in 2029 are a coal emissions peak in 2025; PEAK DEMAND of All Liquids in 2029 (100-Mbd); and a natural gas emissions peak in 2035. These updated findings of Freddy Hutter's original Dec/2007 study continues to contrast substantially with the consensus view represented by the Hansen & Kharecha white paper (NASA Nov/2007) suggesting co2 will peak @ 585-ppm in Year 2100. It assumes a 96-Mbd oil peak in 2016 - but is based on a 2003 study by EIA/Wood. The Trendlines Research study is founded on a premise that the GDP/Energy Demand scenarios within IPCC 2001 were overly optimistic in the sense they assumed the growth accompanying increases in population and rising disposable incomes in the BRIC nations would be fueled by fossil fuels. Unfortunately, there isn't enuf oil, coal and natural gas left in the ground to feed the magnificent projected Demand. The target GDP growth may well occur, but will be enabled by efficiencies, conservation and increases in nuclear generated power. March 29th delayed FreeVenue public release of Dec 29th MemberVenue guidance ~ Update of the annual co2-GHG analysis by Trendlines Research reveals it is quite improbable co2 will ever attain the 695 ppm level for Year 2100 indicated by Mauna Loa gains, or the 730-ppm suggested by the trend of global readings. Both lofty figures wrongly assume there is an unlimited supply of coal, oil and natural gas to quench the appetite of developing BRIC nations. On the contrary, today's study reveals current estimates of remaining fossil fuel resource and declining growth rates for demand should see fossil fuel emissions peak in 2029. This event would result in a maximum co2 atmospheric concentration of 423-ppm (393 today), declining to 348-ppm by Year 2100. 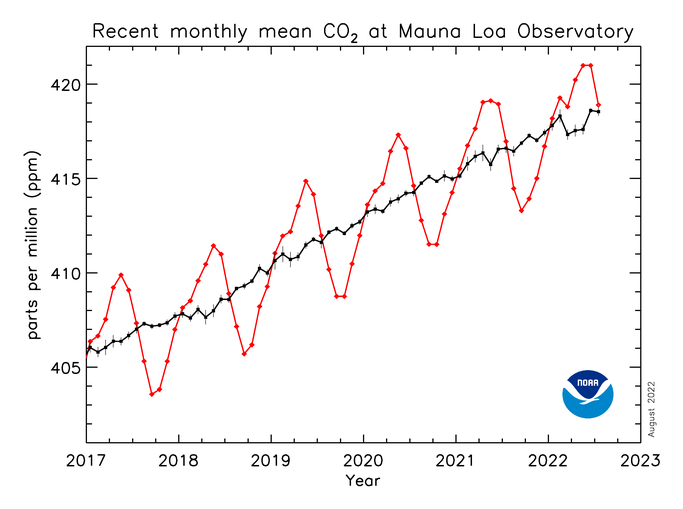 This analysis shows atmospheric co2 concentrations and the related growth rate both continue to rise (see coral & yellow lines). Since the 60's, annual increases have risen from less than 1ppm to 3ppm/yr. If there is good news, it is that concentrations of the 16 Greenhouse Gases as tracked by the NASA GHG Index are growing more slowly (1.2% annually rather than the near 3%/yr back in the early 80's. This is thanx to headway in the methane and CFC fronts. The infamous Al Gore graph spike (the stepladder one) is pure fantasy. Its absurd 800-ppm peak was based on an upward spike in co2 associated with the 1998 El Niño. This episode is viewable via the co2 emission growth rate in the chart below. The 2001 IPCC Report, while well intentioned, applied an extrapolated exponential increase in co2 and temp's based on that anomaly. Observations over the subsequent 10 years have shown albeit the co2 emission rate is indeed increasing, it is not at the alarming rate suggested by some scientists and social engineers of the IPCC 2001 era. There are many rumours of ocean sea level rising out-of-control. Below we see eustatic sea levels rose 2mm/yr or 20cm (12") thru the 20th Century. Yet when we improve the resolution to view the last 16 years, it is clear that the rate of rise has only adjusted to 3mm/yr. Note that the 2006/2007/2008/2009 alarmism surrounding polar melt water is not reflected in this presentation. Since 2005, the long term rate of increase for sea level has ranged from 2.84mm/yr to 3.33mm/yr, thus projecting an ocean rise of 28 to 33 cm (12") by 2100 AD. The data slope shows no dramatic growth rate is in play as the McDoomers claim. It is going to be quite hard to flood the third storey of Manhattan skyscrapers at this rate. What was Al Gore thinking?